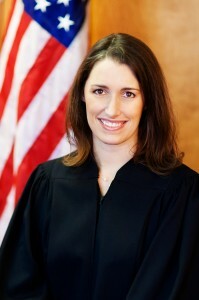 Sara L. McCulloch worked for 13 years at the King County Prosecuting Attorney’s Office in Seattle before being appointed Bainbridge Island’s Municipal Court judge in November. This is the fourth of nine entries about reporter Ethan Fowler’s participation in the Bainbridge Island Police Department’s Citizens’ Police Academy. Despite being on the job only three months, Sara L. McCulloch came across knowledgeable, confident and friendly when Bainbridge Island’s Municipal Court judge spent more than an hour talking about her job to Citizens’ Police Academy participants March 18. McCulloch worked for 13 years at the King County Prosecuting Attorney’s Office in Seattle before she was appointed to the part-time position for a four-year term in November. She sees about 20-35 cases on the Mondays and Tuesdays the court is in session. McCulloch described the court as a “People’s Court” because of the variety of misdemeanor criminal cases brought before her. Driving under the influence, assault, domestic violence offenses, hit and run, malicious mischief, theft, trespass, reckless driving and use of drug paraphernalia are some of the criminal charges under the Municipal Court’s jurisdiction. The court also provides anti-harassment and sexual assault protection orders, as well as search and arrest warrants. Despite the wide range of cases handled, court administrator Telma Hauth – who recently celebrated her 20th year in that position – said the Municipal Court constitutes only 1 percent of the city’s budget. She said the Municipal Court largely has a “focus on rehabilitation,” where with a felony at the Superior Court level the “focus is incarceration.” McCulloch said her court provides a lot of treatment opportunities and options for people who frequently appear before her. McCulloch also distributed handouts about Washington’s court system and a sample of the mountain of paperwork involved in a DUI conviction to Citizens’ Police Academy participants. She later donned her black court robe to present a mock DUI hearing with academy participants portraying attorneys and the driver, while court security officer Guy Roche and Hauth played themselves. Barbara Chandler-Young, a client advocate for the YWCA of Kitsap County in its domestic violence program, spoke after Roche. She said that protection orders “really work” for some people and for others they don’t. After the meeting ended, McCulloch asked me to please remind drivers to always have four things up-to-date in their car or on them when they drive: a valid driver’s license, signed registration, proof of insurance and license tabs. “All of this is a citation that could cost you a lot of money,” McCulloch said if an officer pulls you over and you’re missing one of those items.